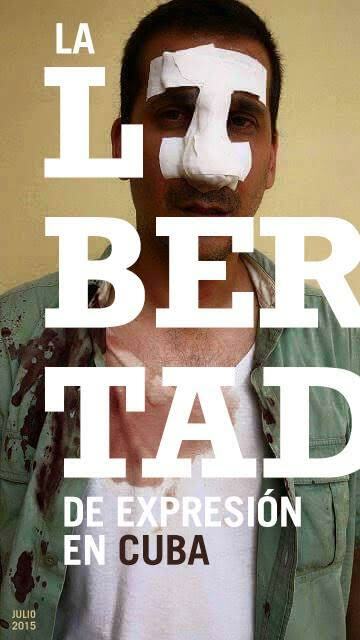 Eliécer Ávila, 6 July 2015 — With horror and profound indignation I learned what they did to Antonio Rodiles yesterday. The bloodlust of these characters is no different from what motivated the torturers of the 1950s, those who do not defend the freedom of their people, but brag about ganging up to beat down a citizen whose only weapon is his mind. Is that being Revolutionaries? Is that being the New Man? God deliver our children from lowering themselves to such extremes. . .
What will they do when the people rise up en masse in the streets? Will they be capable of striking women, children and the elderly? Yet they are already committing these atrocities on an individual, but recurring, basis. The cowardice of the thugs who attacked Antonio is noteworthy, but even more noteworthy is the passivity of those who observe without reacting to the abuse and the pain suffered by others. I don’t agree with Antonio Rodiles on various topics, which we have both made clear, but that doesn’t keep me from feeling the same disgust toward his batterers, and suffering that same disgrace to dignity and to life, as if it they had done it to me.